The ‘Game of Thrones’ premiere took place on Wednesday night. There were plenty of major fashion moments, but we can’t ignore the beauty. 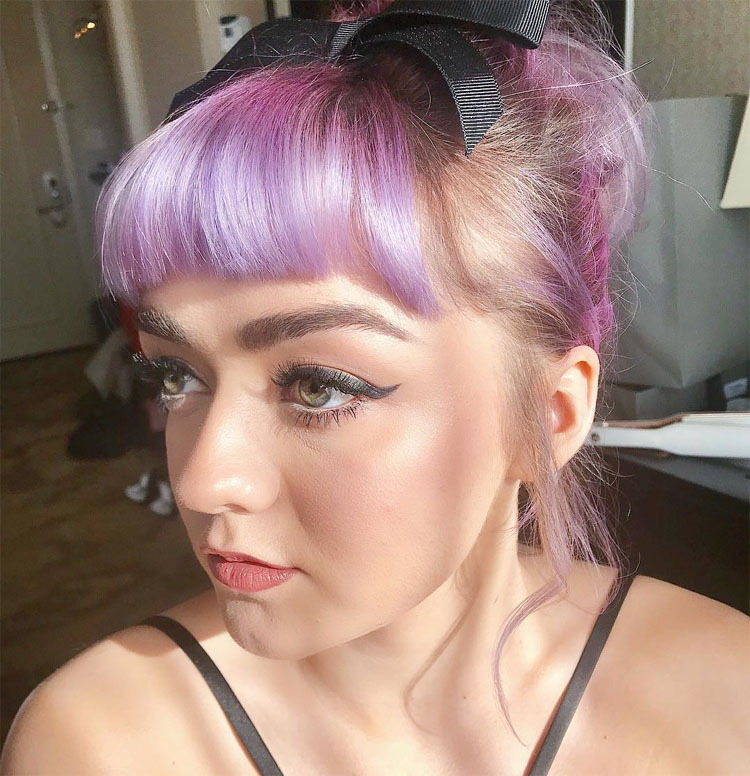 One that caught my eye was Maisie Williams, who not only stepped out with new mauve hair, but her makeup was pretty awesome too – especially as she used the new Urban Decay collection inspired by the hit show that’s due to drop next week. Celebrity makeup artist Kindra Mann shared how she created the look which focused on retro-inspired lashes and strong cat-eye liner. To start, brush Urban Decay All Nighter Concealer under eyes and over any blemishes followed by Urban Decay All Nighter Liquid Foundation for an even skin tone that will standup to flashbulbs and last through the night. Next, apply highlighter from the UD I Game of Thrones Mother of Dragons Highlight Palette in the shades Rhaegal and Drogon to the cheekbones and nose for a glamorous, glowy look. To prep the eyelids, apply Urban Decay Eyeshadow Primer Potion in Sin. Next, heavily line the top lid with Urban Decay 24/7 Glide-On Eye Pencil in Perversion, winging out on the end for a sultry cat-eye. Line the waterline with Urban Decay 24/y Glide-On Eye Pencil in Yeyo. From the House Targaryen section of the UD I Game of Throne Eyeshadow Palette, brush on Take the Black over the liner to punch up and smoke out the color, creating a diffused smoky cat eye. Swipe the shade Hardhome over the brow bone and in the crease of the eye for dimension. Finish the eye with a thick layer of Urban Decay Perversion Mascara on the top and bottom lashes. Clump the bottom lashes a bit for a doll-like look. Next, comb through brows with Urban Decay Brow Endowed in Dark Drapes followed by the Urban Decay Brow Tamer in Dark. To finish and define the brow, use the marker end of Urban Decay Brow Blade in Dark Drapes and draw in and extend brow. Apply Urban Decay Vice Lipstick in Backtalk to the lips. Finish the look with allover spray of Urban Decay All Nighter Makeup Setting Spray.